Calmar has 23 years of experience in commercializing new ultrafast fiber laser technologies. The unique fiber optic technology platform enables Calmar to produce highly reliable products with high performance in terms of short pulse width, high peak power, compact and excellent beam quality. Fiber lasers have a gain medium based on a doped fiber structure. In a fiber, light does not suffer diffraction and is guided through a robust waveguide. The fiber laser components have been engineered to pass very stringent industrial standards. This gives a fiber laser advantages in term of high reliability, high efficiency, and compactness. Fiber lasers use the same rare earth doped glass as high power solid state lasers in free space. Both types tend to use diode lasers to pump a rare earth ion such as Erbium, Neodymium, or Ytterbium, which can store the energy for milliseconds until stimulated out by the optical laser power. However, fiber lasers tend to be more stable as they have no bulk optics on mounts that can misalign or drift over time or with temperature. 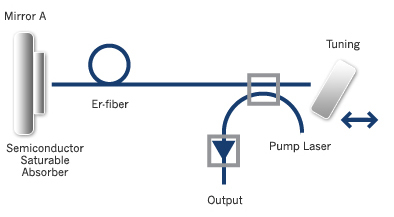 The fiber can achieve more optical gain from the long length. Cooling through the thin fiber leads to efficient simple air cooled systems. The fibers can be wound into a small spool for compact modules with high power and sophistication. At higher powers and pulse energies, the fiber is affected by very high optical intensity due to the small diameter beam. Thus effects such as Self Phase Modulation and Raman Scattering can dominate laser performance and limit the capability of the laser. Several methods to reduce the effect of high intensity nonlinearities include stretching the pulse out in bandwidth or time. Calmar is experienced at handling these effects while still giving all the advantages of stable long term performance and compact size from an optical fiber. These fiber lasers use Er or Yb doped fiber as a gain medium and a semiconductor saturable absorber for passively inducing mode-locking. The output pulse widths are from picoseconds to femtoseconds with very low timing jitter. Calmar’s patented technology enables making a 10-100MHz oscillator for femtosecond and picosecond pulses in a very compact form. These fiber lasers use Er or Yb doped fiber as gain medium and an electro-optics modulator for actively inducing mode-locking. They produce picoseconds to femtosecond pulse widths with very low timing jitter. Due to low noise nature of fiber gain medium, the actively mode-locked fiber laser use harmonically mode-lock lasers to produce stable output in a wide range of repetition rate , from several MHz to 50 GHz or even higher. Calmar has developed compact fiber amplifiers to amplify ultrashort high peak power optical pulses. We have developed the expertise to minimize the effects of Self Phase Modulation (SPM), Raman and chromatic dispersion. 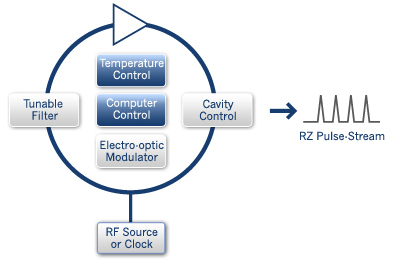 To reach higher output energy per pulse for ultrafast optical applications, Calmar uses the technique of Chirped Pulse Amplification. The optical pulse is stretched by chirping (spread out in time by frequency) to a longer duration before entering the high power amplifier. This pulse stretch minimizes the peak optical power and greatly reduces unwanted nonlinear optical effects for a given pulse energy. After the optical pulse reaches high power, the chirp is removed by linear recompression of the stretched pulse to an ultrashort pulse.